Using the exhibition Harry Potter: A History of Magic as inspiration, explore and create magical illustrations! 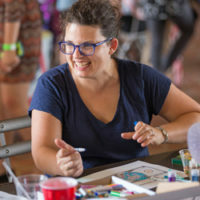 In this five-session course, you’ll study essential art-making skills and learn how to transfigure your ideas from brain to page. Participants will come away with an anthology of their fantastical art! During this course, participants will visit the exhibition Harry Potter: A History of Magic.